Universal Design for Learning (UDL) was developed by David Rose and Anne Meyer from CAST (Center for Applied Special Technology). 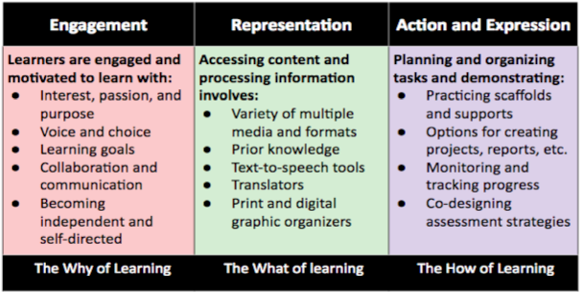 After learning more about UDL, I can see how UDL can be the framework for learning for all learners of all ages. 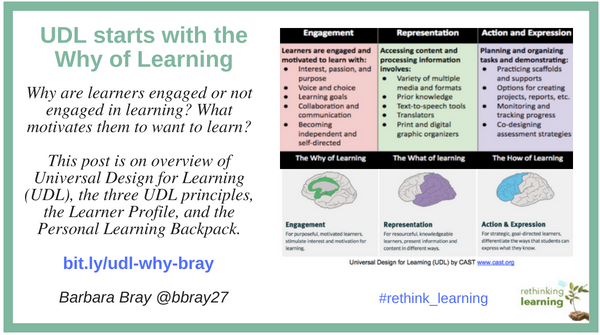 I love that UDL starts with the why and how learners are engaged and motivated to learn. The WHY means what learners are interested in and passionate about. I like the idea of being curious about who we are as learners. 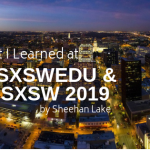 Why not ask our own WHY to ourselves about how we learn? 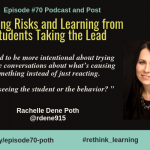 Why are we engaged or not engaged in learning? Why do we need to be motivated to want to learn? Why would we want to become independent and self-directed? 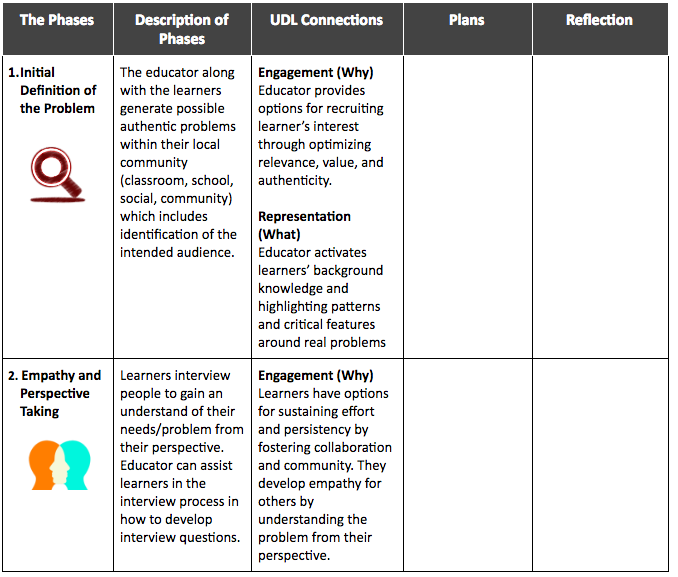 I decided to explore the UDL principles from my perspective as a learner. I know that I need to be motivated first about something new that I want or need to learn. I’m kind of busy. There has to be a reason or purpose for my learning. 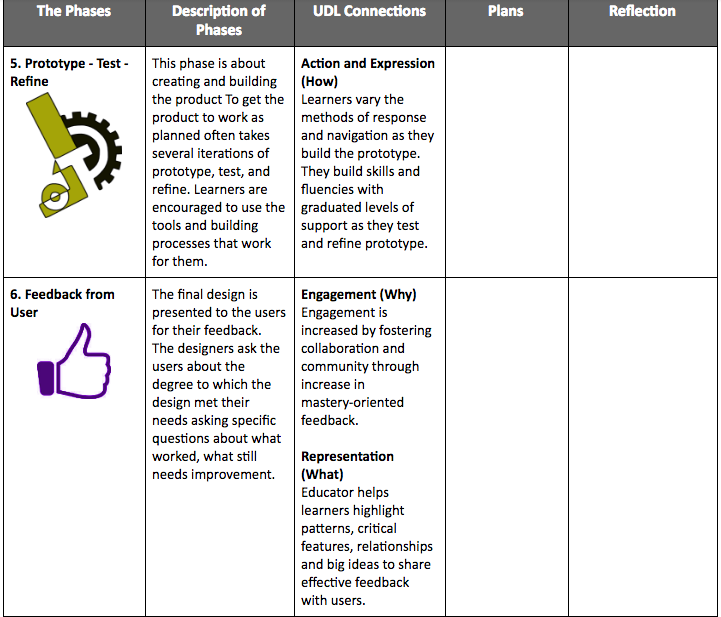 When I thought about this, I got it why UDL starts with Multiple Means of Engagement. This is what makes learning personal for me. It is not about what someone else teaches me unless I choose to take their course. I first have to be interested in what I want to learn. 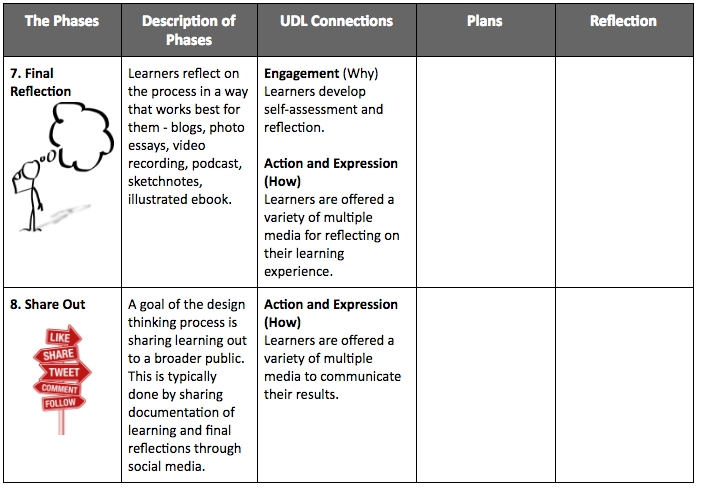 So I decided to add a few strategies for each of the three UDL principles to help me understand what that might mean for all learners. The bullet points I listed may vary depending on who applies these concepts of the why, what, and how. 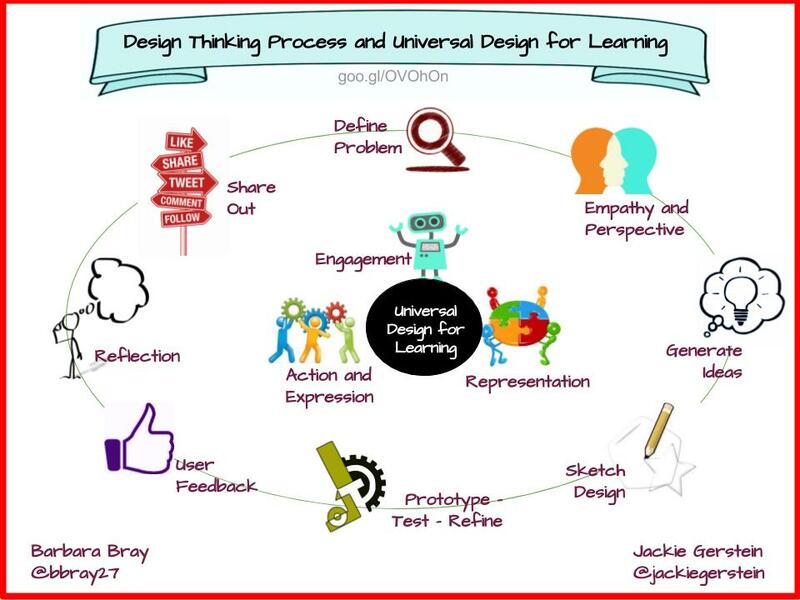 In my first book, Make Learning Personal, UDL started with the What of Learning. 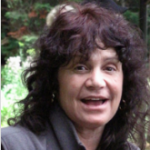 Recently, Anne Meyer, David Rose, and David Gordon, co-authors of Universal Design for Learning: Theory and Practice, changed the order of the principles to start with the why. I agree with them. I really believe you need to know the why before the what and how. When I put the ideas together this way, it made sense for me. I could see why it is important to start with the WHY of learning. 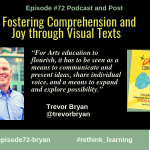 We need a voice and choice in our learning so we have a say in how content is represented. We may all process that information differently so this is why we need to know how we learn best. UDL helps us do that. I figured if I’m going to share this, I needed to see how it worked for me as a learner. 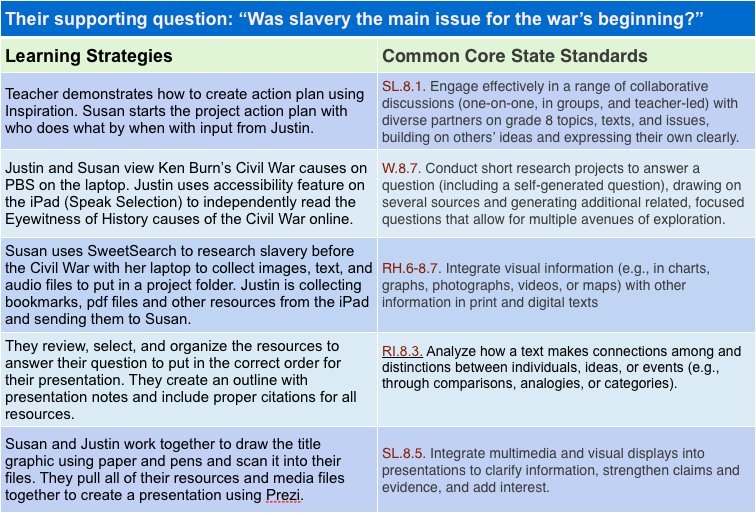 So I took the approach I used in the work I did with personalizing learning but changed it to fit the idea of starting with Multiple Means of Engagement and the Why of Learning. When I consider the principle of engagement, it is more than just engaging me in learning; it is how I am empowered to want to learn. I have a more detailed survey that I use with schools I work with, but I found that sometimes less is more. I also had to show that engagement was about motivation and purpose and different than what was listed under action and expression. I just put in a few bullet points under each section, but you can add as many that apply to you. 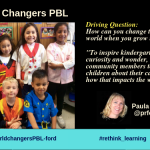 Why are you engaged in learning? What motivates you to want to learn? Why would you want to become independent and self-directed? What I noticed is that when I started writing about my strengths and challenges for engagement, it was all about purpose. I wasn’t sure of my purpose. This was big for me. I’ve been focusing on making learning personal for years and now I wasn’t sure. It’s not about making learning personal for someone else. Each learner needs to find that out for themselves. When I added information for me, I saw me. I wanted to share it. I shared this idea with some educators and asked them how they would use this. So they filled it out and then shared what they found out about themselves with peers. I’m going big by sharing mine with you. When I asked someone what they thought about what I wrote, they asked me questions that led to some very interesting conversations. One teacher said that when I wrote I wasn’t sure of my purpose, it helped her feel okay about being vulnerable in front of others. She thought I knew everything. No one knows everything. I definitely do not feel like an expert. Every day I learn something new and am humbled by how much I don’t know. Next step was to write what I preferred or needed to help me learn. I only put a few ideas so you could get an idea of how this process works. Putting my thoughts in writing helped me see just what I was thinking. I needed to refine my purpose and spend more time on things I’m passionate about. That’s number one. That’s my WHY. What do you prefer or need to learn? So I decided to go one step further by creating my own personal learning backpack, but I needed to change it by adding the skills, competencies, tools, apps, and resources I will need to succeed and become future ready. I’m using that term for me and any learner because I believe learning is about preparing for whatever is ahead for us. I love technology and have always experimented with tools and apps. I find that there are so many apps that I reach out to others in my PLN for help or ideas on how to use different apps. It doesn’t matter how young or old we are, each day is new. The backpack also includes learning strategies so we own and drive our learning. This means we become self-directed and independent learners who have agency. What I found out was the first thing I needed was to build my self-confidence around finding my purpose. That meant changing my mindset and using the power of YET more. I can do anything I put my mind to if I want to. I am not sure even what tools I will need to learn, YET. If I say I don’t think I can write another book, I need to add YET. If I say, I’m not sure how to do this or that, I need to add YET. I wonder what my backpack will look like in a year. I tried this process in several workshops and keynotes. So far, the feedback was great and helpful. Like I said, I am still learning so I may even make some changes. 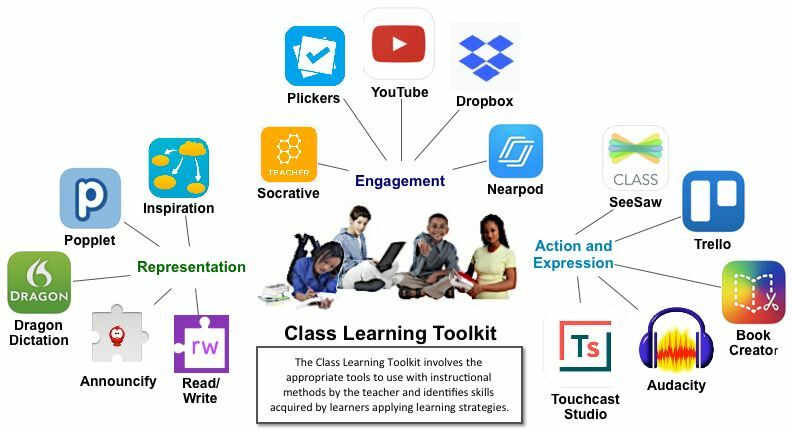 I am curious to see the backpacks learners create and the conversations they have about their learning. Who knows what the future will hold for us? How will you become future ready? What will you need to have agency? Personalizing learning means different things to different people. 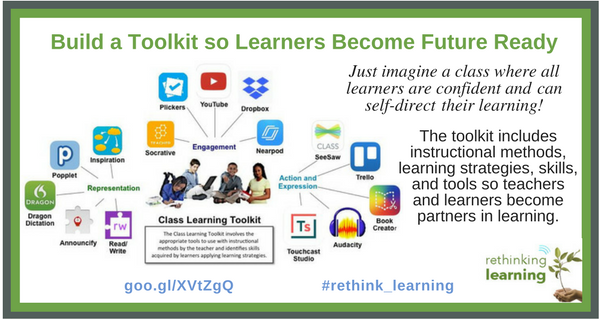 The idea I want to share behind personalized learning is to empower learners including you as a learner to own and drive learning. That’s not easy especially when teachers have so much on their plates. It could be easier to continue with the status quo. But the teachers I know want the best for all of their learners. 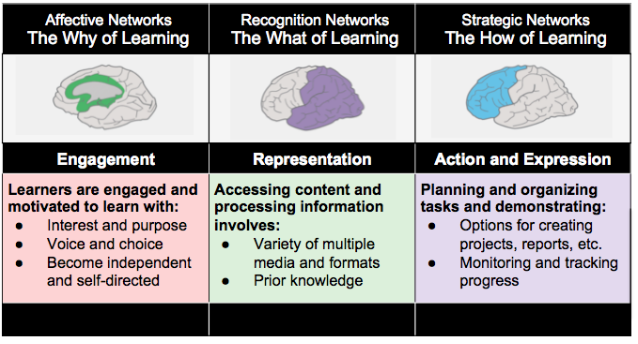 This post is to provide a few reasons to consider when you personalize learning. 1. No one is average. 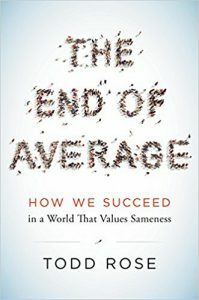 In Dr. Todd Rose’s book, The End of Average: How We Succeed in a World the Values Sameness, he explains why we came to embrace the scientifically flawed idea that averages can be used to understand individuals. 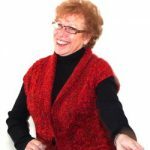 Rose offers a powerful alternative with three principles of individuality: the jaggedness principle (talent is never one-dimensional), the context principle (traits are a myth), and the pathways principle (we all walk the road less traveled). He explains that we are all unique and can take full advantage of individuality to gain an edge in life. So why is this one of my reasons to personalize learning? I believe each of us is unique and all of us are learners. When I read Dr. Rose’s book, he explained about variability and why education has to change to meet the needs of each individual learner. 2. The Myth of Learning Styles. We are all unique as Dr. Rose mentioned in his book, End of Average. Because of who we are and how we all learn in different ways, learners have preferences about how they learn. According to the authors [Riener and Willingham, 2014], whether we call it talent, ability, or intelligence, people vary in their capacity to learn different areas of content, differ in their background knowledge, and, intertwined with ability, they differ in their interests. When we identify a learner as one learning style over another, it does not follow the research about how the brain works. We use all of the modalities because that is how our brain works. 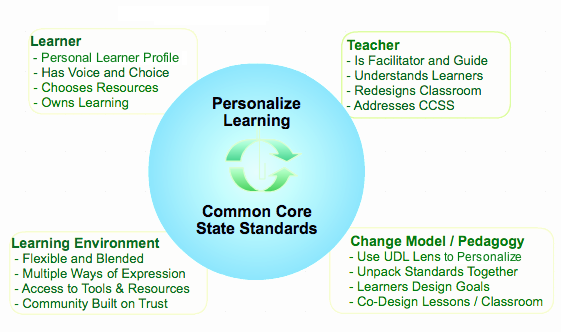 So why is this one of my reasons to personalize learning? I’ve seen so many learners labeled visual or kinesthetic so teachers differentiated instruction based on one or two labels. All of us have multiple dimensions that make us who we are. Most of us are visual learners unless we cannot see. Even blind people visualize in their heads what they are seeing. I will be writing more about this, but I hope schools rethink why they should not use learning styles to label a child. 3. How our Brain Learns. Learning is a neurobiological process indicated by the growth and strengthening of connections between neurons. The brain is constantly changing which is called neuroplasticity. This means the brain can be improved and continues to adapt and learn through life even into our old age. The human potential for learning is limitless at any age. When you learn something new, your brain makes new connections. Your brain is even active when you reflect on your learning. You learn when your brain is active especially when learners ask questions, investigate, create, or reflect on their learning. Passive exposure or listening to a lecture does not necessarily lead to learning. So why is this one of my reasons to personalize learning? Our brain is constantly changing as we learn. When a school or parent believes that a child is born with certain traits or talents, this can cause the child to believe that’s all they are. This happened to me. I was told I wasn’t very smart. I believed that during most of my school. My parents always believed in me and fought for me. And, on my own, I read and was hungry to learn. So I did. I was lucky to have parents who believed in me and a teacher who believed in my writing. I finally realized that I could learn anything if I put my mind to it. So now I write, share, and learn something new every day. I know that every child can learn because their brain is growing and learning every day. All children can learn if we give them opportunities and the support they need. David Rose and Ann Meyers from The Center for Applied Special Technology (CAST) founded Universal Design for Learning® (UDL) based on decades of brain research and the neuroscience of individual differences, human variability, and how we learn. 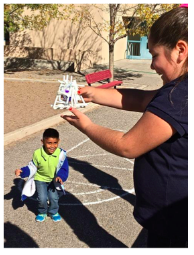 UDL is about reducing or eliminating the barriers to learning and optimizing levels of support to meet the needs and interests of all learners in the classroom. They realized that the curriculum, not the learner, was the problem. 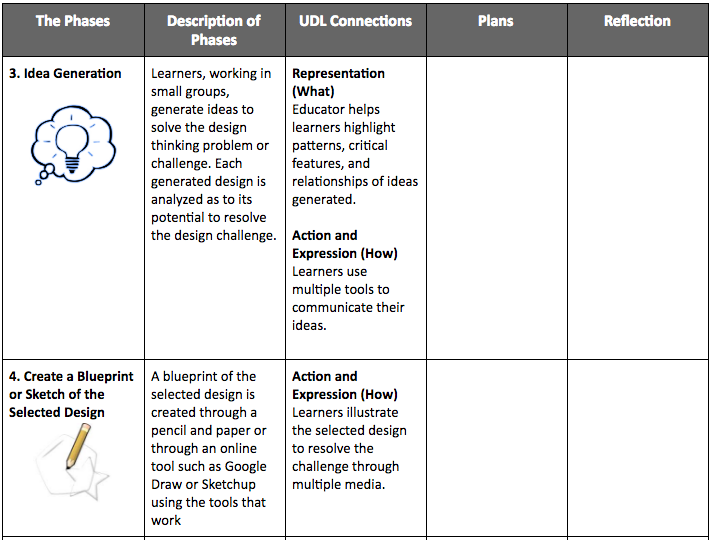 UDL provides a blueprint for creating instructional methods, materials, and assessments that can be customized and adjusted for individual needs. So why is this one of my reasons to personalize learning? We need to put more energy into finding out how children learn best. Universal Design for Learning does that. The three principles, Multiple Means of Engagement, Multiple Means of Representation, and Multiple Means of Action and Expression, pave the way. All three of the principles work together, but when you start with the “Why” of what engages you to want to learn, nothing can stop you. It is about encouraging curiosity and wonder. That passion to learn is what is so exciting about personalized learning. The word “responsibility” tends to be interchangeable with the word “accountability.” In many cases, teachers feel they are the ones responsible for students to learn. The reason is that the system seems to hold them and the school accountable for what students learn. “Accountability” refers to making, keeping, and managing agreements and expectations where “responsibility” is the feeling of ownership. So this means that each learner needs to be held accountable for what they learn by taking responsibility for their own learning. So why is this one of my reasons to personalize learning? If the teacher is the hardest person working in the classroom, then who are the people really learning? Learning is not about passively receiving information. When the teacher is the one held accountable for what kids learn, then learning becomes work, not fun for both the teacher and learners. When our kids have a voice and choice in what and how they learn, they want to learn. They are motivated to learn. When they realize learning is for them not for a grade or for the teacher, they own it and develop agency. All learners can learn. It is our job as educators to provide the environment and support system so learners have a voice and choice in their learning. 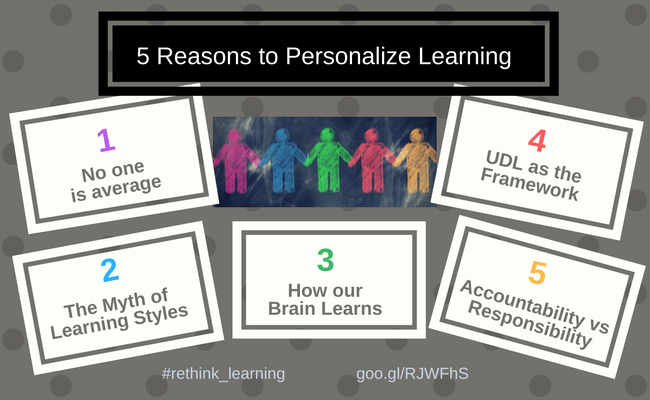 These are just a few reasons for you to consider if you go on the journey to personalize learning for all of your learners. 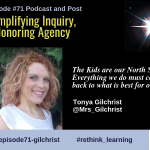 I plan to write more posts that explain each of these reasons in more detail and discuss learner agency in depth in several posts.